Forget about the PSL! A piece of this pumpkin spice baked oatmeal with pecans and raisins is all you need to start the morning this fall! It’s October and that means all things pumpkin are here! Pumpkin picking, pumpkin bread, pumpkin pancakes, and of course the infamous PSL (not up on the lingo? That’s the Pumpkin Spice Latte I’m talking about). You can even find pumpkin used in more savory combinations like Ravioli with Pumpkin Spice Yogurt Sauce, pumpkin cornbread, and pumpkin chili. Clearly there is no shortage of pumpkin recipes for you to enjoy this fall season. I’m sure it’s no surprise to you that oatmeal is one of my favorite foods. I enjoy it for breakfast or dinner, savory or sweet. What I love about baked oatmeal is that I can make it in advance and keep it in the refrigerator for multiple breakfasts throughout the week. It also freezes really well, which is good for adults and kids who like something different for breakfast every day. Just cut the baked oatmeal into individual pieces and wrap in aluminum foil for easy grab and defrost breakfasts. 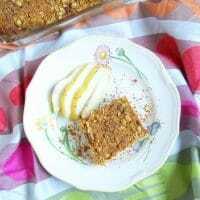 Over the summer I made my fair share of baked oatmeals with berries and stone fruit, but as soon as the weather started to change I had this pumpkin spice baked oatmeal in mind. Baked oatmeal is one of those recipes that’s built on a formula. No matter what mix ins you prefer, the base is the same: oats, baking powder, table salt, milk, vanilla, and maple syrup. Then it’s up to you to decide what spices and fruit you want to include. Canned pumpkin (100% pure pumpkin, not pumpkin pie filling) is the star of the show in this pumpkin spice baked oatmeal, but you definitely don’t want to skip the other ingredients I add. First, a trio of spices – cinnamon, cloves, and nutmeg. Sometimes I throw in some ground ginger too – depends on my mood. Next, chopped pecans provide some crunch and are the perfect nut for the fall. Last, raisins add a bit of sweetness in every bite. I like to top my baked oatmeal with low-fat plain yogurt, cinnamon, and a drizzle more of maple syrup. 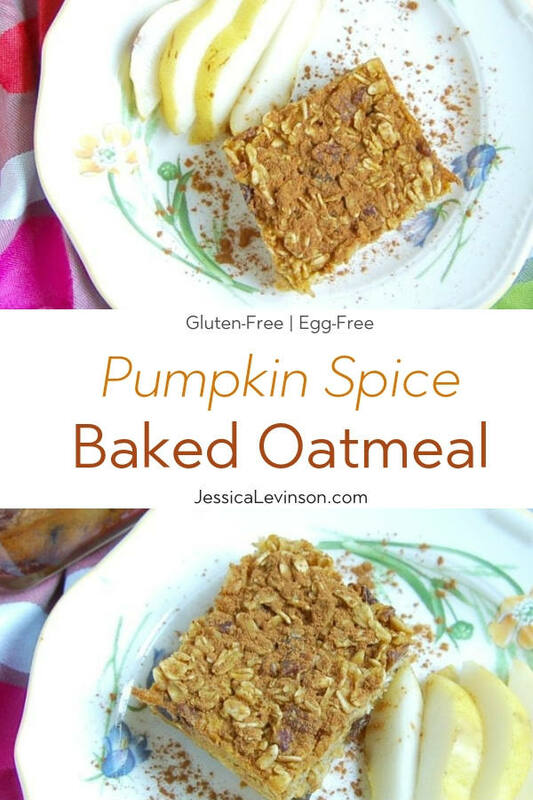 This weekend when you’re planning your menu and making your meal prep list, don’t forget to include this pumpkin spice baked oatmeal – it will save you time and ensure your family has a nutritious and delicious breakfast all week long! 100% pure pumpkin, cinnamon, cloves, and nutmeg are mixed with oats and milk and baked in the oven in this make-ahead breakfast. Pecans add crunch and raisins and maple syrup add sweetness, providing a balance of flavors and textures. An easily modifiable recipe based on taste preferences. Preheat oven to 350 degrees F. Coat an 8x8 baking dish with cooking spray and set aside. In a large bowl, mix oats, baking powder, cinnamon, nutmeg, cloves, and salt. Add milk, pumpkin, syrup, and vanilla and stir well to combine. Fold in raisins and pecans. Pour oatmeal mixture into prepared baking dish and bake for 25 to 30 minutes until completely set. Serve topped with additional cinnamon, yogurt, and/or maple syrup, if desired. Are you loving all things pumpkin this fall? Share your favorite pumpkin recipes with me in the comments below! Yay, can’t wait to hear how you like it Rebecca! This looks delicious! Oats are my favorite and combining with pumpkin for fall hits the spot! Can’t wait to try it out! Is it more of a thick bar? Or is it still kind of oozy when you put a spoon/fork to it? Looks wonderful! It’s completely set- not oozy like a regular bowl of oatmeal. I cut it into pieces, but you can totally cut it into bars too. Let me know if you tru it. I’m in love with baked oatmeal right now. It’s all I want in the Fall…this sounds amazing, can’t wait to try it! So glad you like baked oatmeal too! So many great ways to change it up and keep it from getting boring. 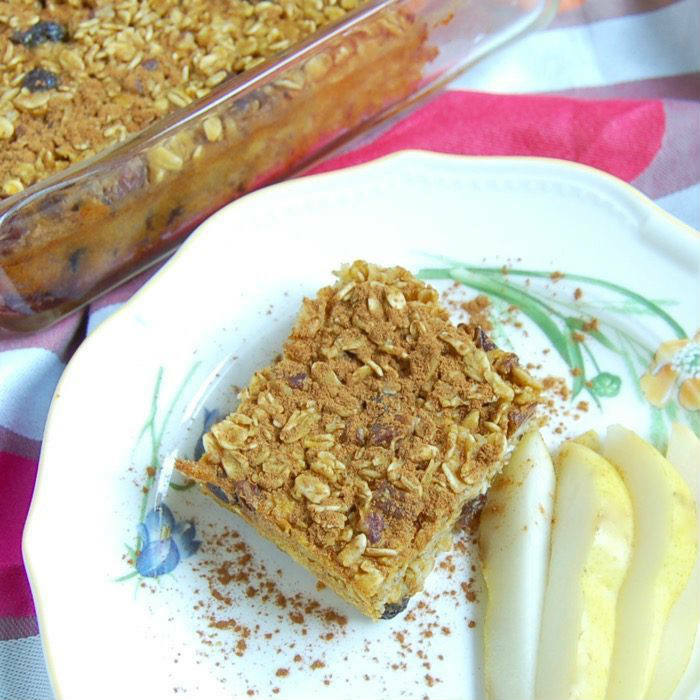 Hope you enjoy this Pumpkin Spice Baked Oatmeal version! I bet my kids would loooooove this. Yum! Thanks Ashley! Hope you try it! Pumpkin is a must for fall! So glad you agree Joanna! Thanks Sonali! Can’t wait to see your recipe! Yum! Love pumpkin in everything! I think you’ll like this Spiced Pumpkin Bread then, Linda! What a great spin on breakfast! We get so burned out on eggs or oatmeal, I love having recipes like this to mix things up! Thanks so much Kelsey. I feel the same way. Hope you enjoy it! Sounds like a delicious treat for breakfast! I need to make this real soon. Oh yum! 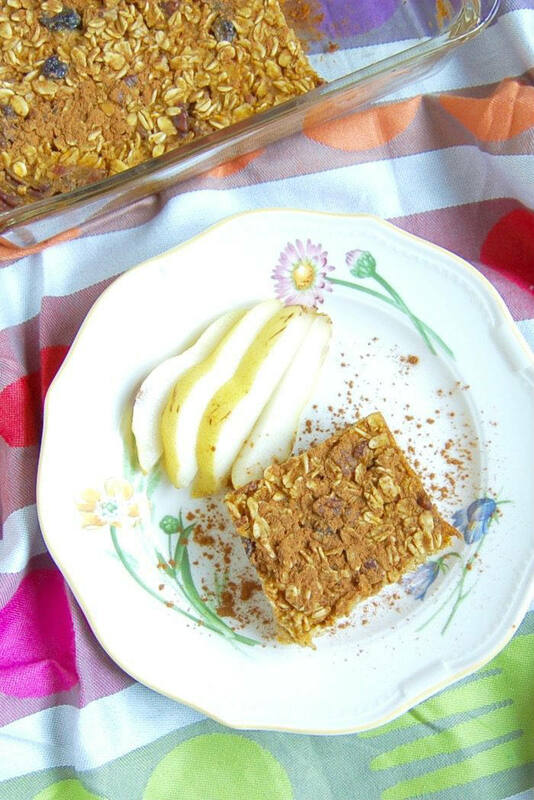 Baked oatmeal is so yummy, I love the fall-inspired twist, so yummy! Love pumpkin spice! Thanks Emily! Hope you enjoy it! WOW. Now here’s a decadent FALL dish! Love the flavours! Thanks for sharing. Decadent tasting, but full of nutrition! Enjoy Carol! mm love that you can make this ahead for a quick breakfast idea! I’ve been making a baked oatmeal every sunday for the week ahead – lots of variations, and it makes it so much easier to ensure the kids get a healthy breakfast when we’re rushing in the morning! I am very excited to discover your site and the fantastic recipes. Thank you. Thank you for coming by Teresa! Please feel free to let me know if there’s anything you want to see or if you have any questions!